See Catholic Saints books, coloring pages, worksheets, and prayer cards below. 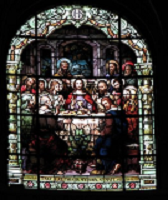 The Apostles were Catholic saints. Catholicism's crown is her martyrs and saints. They prove that the church is "holy" as professed in our profession of Faith: "one, holy, Catholic, and apostolic" (Apostles' Creed). Roman Catholic saints are a proof that what we learn in the catechism is true. We see the same heroic virtues and miracles in their lives as Jesus offered as His proofs that He is the Son of God. Catholic Church history is truly written in their lives. As a matter of fact, the best explanations and examples from the Catholic catechism come from saints stories. Use our free printable saint coloring pages or find more Catholic coloring pages to print for your Catholic catechism class or Bible study. We also have many pages with several lists of fun coloring pages. Instant Catholic saints photo album. My favorite way to tell little children about the different Catholic saints is to use a Picture Book of Saints like a family photo album. I sit on the couch with the smallest children closest to me and we all look at the pictures. If we're simply snuggling for a fun afternoon, I'll ask which saints they want to talk about or simply flip through the book to see which pictures catch their interest. I think this is important. Once kids are interested, they'll learn more and remember the details for a longer time. Since this is true, I really feel as if it is important for the pictures to be of high quality art and to have modest images. We want the children to remember the saints as models of virtue that they can imitate all through life. If we're reading the saints for school we start at the beginning of the book and work through the book in order by page number or by the saint's feast day. For example: In September at the beginning of the school year there are many September saints. Choose one or more to "study", like St. Michael the Archangel. You can say and teach the St. Michael prayer and then give them a Saint Michael coloring page. Second grade children can copy the descriptions or captions, and third through fifth grade children can write micro book reports or essays that are related to the saint of the day. They can look at the text while they're writing or you can suggest important facts or keywords that they can use for creating their own original stories. Children of the Kingdom ebook has an alphabetical list of boy and girl saints. 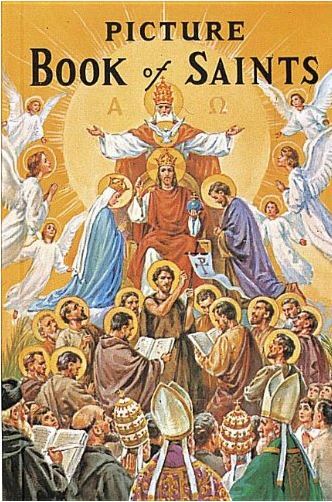 See All Saints Day, one of the Holy Days of Obligation, with Coloring Pages and Reminder Newsletter. My favorite way to learn about saints is from good books like Butler's Lives Of The Saints for high school and adults (NOT Thurston and Attwater's versions). There are many books that are either autobiographies, biographies, or fiction that tell the stories how the saints were holy and how they persevered. We have a very interesting and Irish flavored Saint Patrick history here. Are you looking for the Saint Andrews Day Prayer. Find it on a four up printable card with a coloring page and worksheet here. Do the stories tell the truth? Do they concur with Catholic doctrine? Do they tell the stories with a good language? No bad attitudes, no offensive art? So far, I've found very good books published by Tan Books/Neumann Press, Our Lady of Victory School, and Mother Of Our Savior. They have republished many beautiful saints books with attention to detail. James Fitzhenry at Roman-Catholic-Saints.com has an awesome list of Incorruptible Saints with wonderful introductions and pictures. Saint Fernando III: A Kingdom for Christ an incorruptible saint and the greatest Spanish Catholic king. Defenders of Christendom where each chapter tells of a different age in history where Catholic knights honored God and preserved Europe from invasion. What about an easy to read biography of Saint Joan with dozens of excellent pictures of Joan? She is a very great Catholic saint. MaidOfHeaven has a large website dedicated to the Biography of Saint Joan with information about the biography by Ben D. Kennedy titled Maid of Heaven: The Story of Saint Joan. The site also contains extensive biographical facts about St. Joan like her passion, trial, and death with many useful pages like the long Biography, timeline, quotes, references, pictures, movies and DVDs. In all over fifteen hundred pages online containing everything about Saint Joan and her life and history. She is one of my favorite Catholic saints.